Janie Bress - My North Shore Blog: 10 Tips for Selling Your North Shore Home this Fall! 10 Tips for Selling Your North Shore Home this Fall! Thank you for taking the time to stop by my North Shore blog! I’m sure you’re getting ready to celebrate the extended Labor Day weekend and your fall routine is underway. Fall in Chicago’s North Shore is a favorite time of year for many of its residents! Whether you live in Winnetka, Glencoe, Northbrook, Highland Park or Deerfield; you’re sure to enjoy the crisp, fall air, local football games and cooler evenings that are just around the corner! For many North Shore residents, they hold off on selling their home until the fall season as summer schedules seem to have buyers preoccupied with enjoying the long summer days. Consequently, the North Shore Real Estate market will pick up in the early fall as buyers want to find a beautiful North Shore home and be completely settled before the holiday season. If you are considering selling your North Shore home this fall, take a few minutes to review these ten tips that can help your home stand out from amongst the competition! 1. 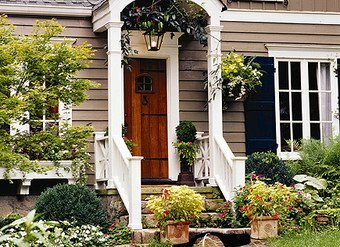 Focus on curb appeal- Selling your North Shore home during the fall certainly comes with one advantage: the season's beautiful foliage which can automatically make your home more attractive for showings. However, you still need to do your part to keep your home looking its best. Start by sprucing up your lawn, keep falling leaves at bay with frequent raking and patch up any brown spots in the grass. 2. Appeal to the senses- As the weather cools down in the North Shore, make your home a warm, welcoming space where buyers will want to stick around. If you encourage them to stay awhile during showings, you give them more time to admire your home's best features. 4. Update your listing photos- If your North Shore home was listed last winter or spring, talk with your North Shore Real Estate agent about updating your home’s marketing with brand new fall shots. Pictures from the previous season make your listing seem dated. 5. Think like a buyer- Fall house hunters are looking for great deals on North Shore homes, so be prepared for lowball offers and possible non-serious buyers. Manage your expectations and negotiate accordingly, depending on your motivation. 6. Hire a reliable real estate professional- As if selling your home isn't stressful enough, you're probably thinking ahead for the holidays or helping the kids ease into a new school year. During this hectic season, you definitely want a great North Shore Real Estate agent to take some of the pressure of selling your home off your shoulders. If you are still searching for an agent; I’d love to help you sell your North Shore home! 7. Price it right- If you want to grab the attention of North Shore buyers in this competitive market, you need to price your home correctly from the start - possibly slightly lower than comparable homes in your neighborhood. Setting your listing price just right could lead to a bidding war, resulting in a higher sales price for you. Work with your North Shore Real Estate agent to price your home correctly. 8. Watch your timing- Put your North Shore home on the market well in advance of looking for a new home. And don't place an offer on your next home until you have solid offers on the one you have to sell now. The last thing you want to do is juggle two mortgage payments. 9. Beware of TMI (too much information)- Buyers think most sellers these days are in dire straits, so don't do anything to add to that perceived advantage and lower your potential selling price. For instance, if you are moving from the North Shore due to a job transfer, it's best not to offer up that information or at the very least, downplay the urgency. While you are obligated to disclose everything about the property's condition, you aren't obligated to disclose your personal situation. 10. Be flexible- We are currently in a buyers market in the North Shore so be willing to work with buyers to help your chances of making a quick sale. Offer to pay for closing costs or repairs, and be adaptable when it comes to showing your home and holding open houses. If you really need to sell your North Shore home, you need to accommodate buyers' busy schedules as well. This might mean opening your home on weeknights and weekends. Be flexible! I know you probably have a lot on your mind right now, but I would enjoy answering any questions you have about the North Shore Real Estate market! I have been working as a North Shore Real Estate agent for over twenty five years and have a proven track record of getting homes sold. Please feel free to contact me today to get started! I look forward to helping you sell your home!